Austrian physician; born at Bodenbach, Bohemia, May 31, 1851. He studied at the gymnasium at Prague and at the universities of that city and of Vienna, obtaining his M.D. degree in 1882. From that time until March, 1885, he was assistant in the Physiological-Chemical Institute of Prague, and in November of that year he took a similar position at the Pathological-Anatomical Institute in the same city. In 1888 he was appointed privat-docent in internal pathology at the University of Prague, a position which he held until 1890, when he became assistant to Kohler at the clinic of the Allgemeines Krankenhaus, Vienna. 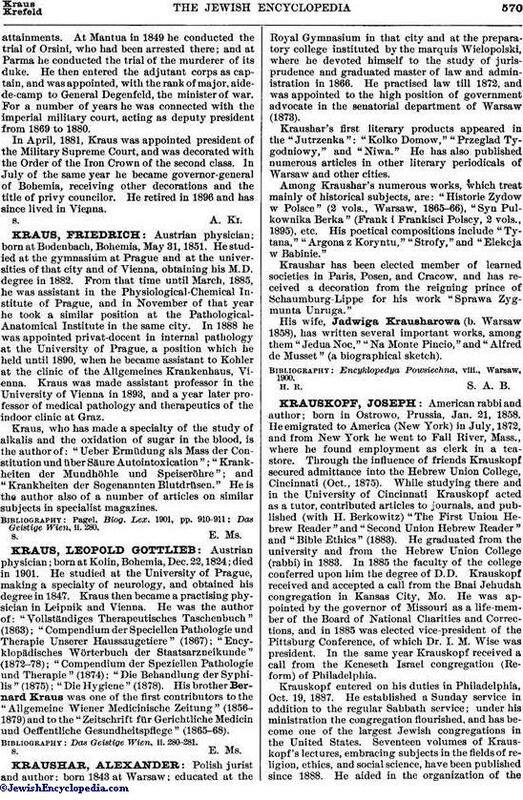 Kraus was made assistant professor in the University of Vienna in 1893, and a year later professor of medical pathology and therapeutics of the indoor clinic at Graz. Kraus, who has made a specialty of the study of alkalis and the oxidation of sugar in the blood, is the author of: "Ueber Ermüdung als Mass der Constitution und über Säure Autointoxication"; "Krankheiten der Mundhöhle und Speiseröhre"; and "Krankheiten der Sogenannten Blutdrüsen." He is the author also of a number of articles on similar subjects in specialist magazines. Das Geistige Wien, ii. 280.